"If you want to see your daughter alive again, listen carefully"
When the body of a snatched schoolgirl is found in an abandoned biosciences building, the case is first treated as a kidnapping gone wrong. But Detective Kay Hunter isn't convinced, especially when a man is found dead with the ransom money still in his possession.When a second schoolgirl is taken, Kay's worst fears are realised.With her career in jeopardy and desperate to conceal a disturbing secret, Kay's hunt for the killer becomes a race against time before he claims another life. 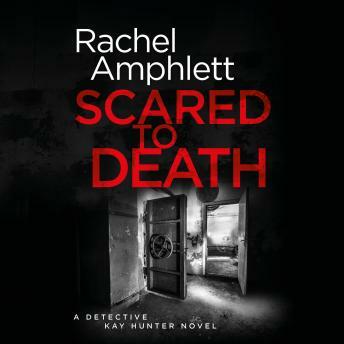 For the killer, the game has only just begun...Scared to Death is the first book in a new crime thriller series featuring Kay Hunter - a detective iwth a hidden past and an uncertain future...If you like the Kim Stone series by Angela Marsons, Peter Robinson's DCI Banks series and the Erika Foster series by Robert Bryndza, discover Rachel Amphlett's new detective novels today. I enjoyed this gritty British detective story. Kay Hunter is a very interesting character. While the tale starts off in the midst of this gripping kidnapping, it was really Kay’s character that drew me into the story. She’s recently been through the ringer and we get hints of that as we move forward through this mystery. I wanted to know more about her throughout the entire story. The mystery itself was worthy. First, we have a kidnapped teen (Melanie Richards) whose body is later found. The manner of her corpse gives Kay clues but a murdered man later in the story muddies the waters for her. For us readers, we get these scenes from the murder’s point of view. So it’s a delicious cat and mouse game. Later, a second girl is kidnapped and this ups the stakes for Kay. My one quibble is that near the end of the book Kay acts out of character, rushing in. Without saying too much, this was an extremely stupid move and so didn’t fit with her actions throughout the story. I felt it was there just to add drama to the story and it wasn’t really necessary. I liked the teen bullying angle and how other teens react to the kidnapping of the first girl. The parents have a different reaction to the kidnapping, of course, but then to learn about the bullying surprised them. It was a nice touch and it also showed that even after the mystery is solved, there are still things to address with the teens. I have to mention Adam, Kay’s husband. He’s a veterinarian and a very supportive man. We only get a few scenes with him but he appears to be a very solid loving man that is devoted to Kay. That made me happy because she has so much on her plate, has recently been through quite a bit, and everyone needs someone in their corner. All told, an enjoyable read. 4.5/5 stars. The Narration: Alison Campbell made a very good Detective Kay Hunter. She captured all of her numerous emotions throughout the story. Campbell also had regional accents throughout and her masculine voices were believable. All around, it was a very good performance with no technical issues. 5/5 stars.